Beveled: When said of covers made in whole or part with boards, the edges of the covers have been angled as a decorative device. See Figure 6. Binding: The method of holding the leaves of a book together. While the leaves may, in fact, be held together by gluing, sewing, or stapling, the term is used to refer to the outer covers of a book, as if it were the covers holding the leaves together. Thus, books are said to be Bound in boards (alone), boards covered with cloth, paper, or various types of leathers, and enclosed in Wraps. Other materials and combinations of materials have also been used from the common to the exotic. Blank: A page or leaf of a book which is devoid of printing or anything else. Blanks are intentional, but those found at the end of the book (other than a single flyleaf) are less so, being the result of a book's final Gathering having less than its total pages printed. E.g. a 4to book ( See Figure 3) has 4 Leaves and 8 printable pages. If the book is fully printed using only 3 of the available pages, the remaining 5 will be blank. These final, unused pages are referenced as Printer's Blanks. 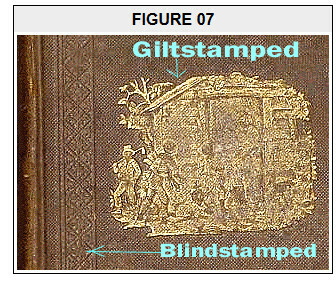 Blindstamping: Letters, decorations, or other marks which have been impressed (usually) in the binding without further adornment such as gilt or color. Also called Tooling. See Figure 7. See also Giltstamping. Blurb: Comments on the dustjacket or covers of a book from the publisher or a reviewer descriptive of the book's contents or value. As a further marketing tool, blurbs may also be supplemented with brief quotes from persons whose opinions will be recognized and trusted by the potential reader. Boards: The material used in the covers of modern hardbound books composed of stiff cardboard or a similar material. Where the term alone is used to describe the covers, it means the binding is paper-covered boards. It is usually covered with materials such as cloth, leather, or vinyl. The origin of the term probably dates to the Medieval practice of binding manuscript between wooden boards. Board Book: An expression applied to books which are not merely bound in boards (see above), but consist solely of boards, i.e. both the covers and the pages are made from sturdy pressed cardboard. While there are exceptions, the format has generally been used for books produced for babies and toddlers. Such books are durable, and can withstand their intended audience's enthusiatic close scrutiny, often expressed by chewing. sucking, ripping, stomping and shaking. They also lend themselves to easily to being diecut into various shapes, as well as laminated for easy cleaning. Book Club Editions: Books printed solely for a book club to be sold to subscribers. While it is generally true that such books have poorer quality bindings and often less expensive paper than the books issued by the publisher for the general retail market, there are exceptions among smaller clubs who specialize in reprinting new editions of books marketed as "collectible" or with appeal to a limited audience. Some major clubs Blindstamp their back cover with their logo, print the club name on the front flap of the dustjacket, or are marked in other ways; others are identified by their dustjackets lacking a price on an inner flap lacking a price on the front flap or, in the case of more recent books, a bar code. Unmarked book club editions, or those lacking dustjackets, can be mistaken for first edition either because they were printed from the first edition plates and are explicitly so marked, or bear the identifying characteristics of the publisher's first editions. Identifying book club edition is a subject unto itself which is covered well by William Chappelear in his "Identifying Book Club Editions" information fround on TomFolio.com. Bowed: A defect found in books whose covers are made with boards. The covers either bow inward toward the leaves or outward away from the leaves as a result of a rapid change in humidity which causes different rates of expansion or contraction between the boards and material covering them. Broadside: A method of public communication using a single sheet of paper that is printed on one side only with the verso being blank. Broadsides originated in 16th century England shortly after the invention of the printing press. The earliest broadsides served as a means for distributing political and religious announcements, as well as the text of English ballads which were sold in the streets. Over time, the broadside came to function as the principle form of public communication. Announcements from government officials, institutions and businesses were joined by those conveying advertisements for products, services and events; political statements; auction sales bills; personal declarations; news; information or opinions about current issues; elegies; amateur and accomplished poems (several important poems by Dryden, Butler, etc originally appeared broadsides); musical scores; etc. Broadsides were both posted and offered as handbills, although because of wide illiteracy in earlier times some were often read aloud before a crowd. Thus, their size may vary from that of handbill to that of a poster. While an early broadside would neither be folded nor intended to be, this requirement has been relaxed due to more loosey-goosey modern practices. When a single leaf of paper has been printed on both sides, it is properly called a Broadsheet. Broken or Cracked Spine: A defect in the spine itself (the edge of the book opposite the foreedge where the Gatherings are sewn and glued together as opposed to the spine cover) whereby it is vertically cracked in the in Gutter between adjacent signatures. Except extreme cases (where the defect is best described as a Split), the separation of the adjacent signatures is not complete, i.e. the Textblock has not been split into two parts, but is being held together tenuously by whatever remains of the binding materials. When this defect is present in the mid-section of a book, it will tend to fall open along the crack when resting on its spine. Cracks close to endpapers may fail this test because there is often less separation. Spine cracks are usually caused by pushing too heavily downward across the spine to flatten leaves, or when the binding glue at the back of the signatures dries to the point of inflexibility. Broken or Cracked Hinge or Joint: A crack along either the Hinge or the Joint of a book. One of both can be cracked, but most frequently it is a hinge. A broken or cracked hinge leaves the affected front or back cover attached to the body of the book, but rather more loosely than desirable. If a hinge has completely parted company with the Textblock, the affected cover is said to be Detached. Browned, Tanned or Toned Paper: Discoloration of the paper in a book or on a dustjacket ranging from yellow tints thru tan to brown due to the presence of lignin, the natural glue that binds wood fibres (cellulose) from which virtually all modern paper is manufactured. If the lignin is not completely removed from the paper pulp mix by bleaching, the resulting paper will, with age, become discolored by acidification; and higher levels of lignin often lead to a brittleness in the paper which, at its worse, causes it to easily crumble when handled. This process is hastened by storage in higher temperature & humidity environments. Until the middle of the 19th century, paper was mostly made from cotton and flax fibres which do not develop this problem. This defect should not be confused with Foxing. Buckram: A strong, durable, coarsely woven cloth made from woven linen, or a mixture of linen and cotton, and, more recently, polyester threads. The cloth is impregnated, coated or filled with a glue or, more recently, plastic materials such as acrylics. Bumped: A commonly found defect which results from the corners or edges a book's boards being bumped. On an edge or spine, it is dent. On a corner, the tip of the board i s at least bent & may also be worn, rounded, a little mashed. If cloth-covered, the cloth at the tip may be frayed.